Ideal for: all street theatre festivals, food festivals and waterfront events. There are prawns dancing and an octopus springing to life alongside strange stirrings in the jellied eel jar and a worrying seafood smoothie amongst other delights. All the creatures are made with exquisite attention to detail and are a joy to look at. 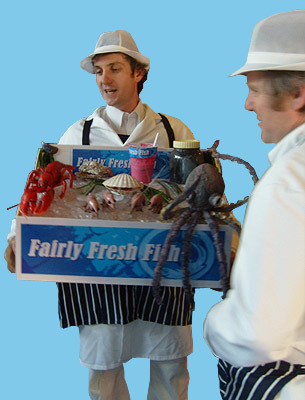 The illusion is achieved by using fake arms to hold up the seafood tray, thus allowing the performer to animate the produce from the underside. Each creature comes with its own story (including the humans!) in an act that has more lines than a mackerel fisherman.